J.C. Penney shares flew high on a positive fourth-quarter report. But why is the struggling retailer optimistic for the year to come? J.C. Penney (NYSE:JCP) shares leapt 14% aftermarket last Wednesday following its fourth-quarter report. The company reported quarterly comparable-store sales growth that lagged only slightly behind the performances of Macy's (NYSE:M) and Nordstrom (NYSE:JWN) and soared past Sears Holdings (NASDAQOTH:SHLDQ). J.C. Penney also showed signs of managing inventory turnover and issued some of the best yearly guidance the company has posted in years. But what's behind J.C. Penney's optimism for 2014? During the earnings call, returned CEO Myron (Mike) Ullman outlined the company's three-phase turnaround plan. J.C. Penney has already moved through the stabilization and rebuilding phases. And now comes the time for the progressive "go-forward" phase that Ullman hopes will carry the company toward long-term growth. What improvements does J.C. Penney predict will occur in 2014? Mike Ullman's return included the need to immediately tackle the inventory issues Ron Johnson's turnaround attempt created. Johnson had done away with some popular private brands to focus on higher-profile brands that often didn't sell as well. Ullman's restocking process involved discontinuing underperforming brands including William Rast, JCP Everyday, and JCP Men's while simultaneously working to increase -- or reintroduce -- brands that have resonated with customers: St. John's Bay, Liz Claiborne, and Arizona, to name a few. Gross margin took a hit last year during the process of replacing the old with the new, which required a hefty amount of markdowns and an inventory turnover problem. But the fourth quarter was the first to begin showing that this process might've neared completion. The full-year growth margin for 2013 was 29.4% of sales compared to 31.3% in 2012. But the fourth quarter showed improvement at 28.4% of sales compared to 23.8% in the prior year's quarter. 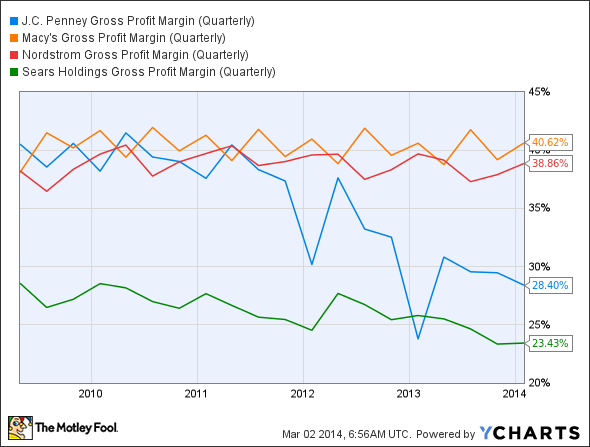 J.C. Penney gross profit margin (quarterly) data by YCharts. J.C. Penney still has some work ahead to reach the margins of Macy's and Nordstrom. But the company has at least recovered from the days it was dipping down to Sears' levels. And J.C. Penney expects to show another margin improvement in the first quarter -- presumably as the company becomes less reliant on markdowns related to inventory overhang. An often overlooked sign of J.C. Penney's slow recovery is the sales performance for the chain's website. JCP.com sales grew 26% in the fourth quarter to $381 million, which was an increase of nearly 6% of the prior year's quarter, which had shown a drop of 34% year over year. What drove the growth? J.C. Penney has focused on unifying the store and online experiences, which included better stocking for both shopping experiences. The website also received a visual overhaul that made online shopping more user-friendly. And the complete overhaul of the home segment, which included Ron Johnson changes that customers particularly disliked, has also helped online sales. Home was traditionally one of the strongest segment sellers through the website, since it's easier to display a number of larger items online than on the showroom floor. The fourth-quarter results reflect a company that's moved through a transition but has yet to prove long-term results. J.C. Penney investors have reason to celebrate that Mike Ullman's at least undone the damage from Ron Johnson's strategies. But remember that Johnson was brought on because J.C. Penney wasn't performing as well as its peers. J.C. Penney's future seems safer than that of Sears, but the company still needs to prove its ability to keep its head above the choppy retail waters.